2018 marks a big shift for restaurant advertising. Compared to 2017, fewer restaurants are actually paying for marketing, and those that are choose to invest in social media promotion and search engine ads. With 41% of restaurant operators naming “Attracting and Retaining Customers” as a top challenge to their success, it’s important for restaurateurs to know how and where to reach new and existing customers online. Below are the most noteworthy restaurant digital marketing trends and statistics for 2018. 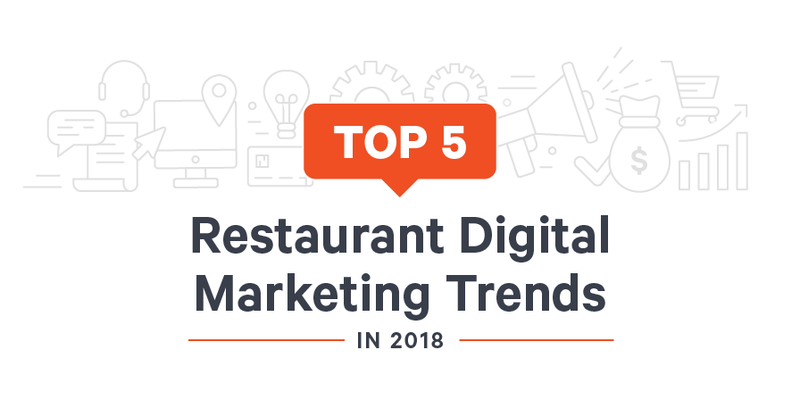 After reading the infographic, make sure you download the full 2018 Restaurant Success Report for more of the latest digital marketing trends in the hospitality industry. Download the 2018 Restaurant Success Report for more digital marketing statistics. 1. 63% of restaurants advertise on social media. Even though social media advertising declined in 2018, it still remains the most popular advertisement method for restaurant professionals – including direct mail, community/event sponsorship, and partnering with a PR agency. There’s a bitter taste in the mouths of many companies when it comes to social media advertising, which could explain its decline in popularity from 2017. Now that Facebook has committed to showing users more content from friends and less from brands/publishers, restaurants using Facebook ads may see less visibility. To make matters more complicated, Facebook ads are increasing in cost, meaning restaurants have to invest more money to reach potentially fewer people. That said, many would say restaurant’s can’t afford to not advertise on social media, as other advertising methods are no longer exposed to audiences as large as they once were. A report featured on Modern Restaurant Management highlights that for Generation Z respondents, “only eight percent...find out about new menu items from TV advertising.” Recent findings also point out that daily newspaper circulation dropped from 52 million in 2006 to 35 million in 2016 and quarterly magazine retail sales has consistently dropped quarter-over-quarter since before 2014. So for the time being, it appears that social media advertising may be an effective method for restaurants looking to make the most of their ad spend, but this could change in the near future. According to Convince and Convert, social media usage is down after a consistent rise in the past nine years. In 2018, 77% of those 12 and older are using social media as opposed to 80% in 2017. Social media seems to be losing its steam, and restaurateurs may soon have to find a new top ad choice. 2. 26% of restaurants advertise on Google or search engines. Search engine ads rank fourth in popularity, behind social media ads, community/event sponsorship and newspaper advertisement. However, since registering a restaurant for Google My Business is free, restaurants may be taking advantage of this costless solution from search engines. Google is actually more likely to show a restaurant towards the top of a “restaurants near me” or related search if they have filled out their Google My Business listing. The process takes just a few minutes, and by providing simple accurate information like hours, phone number, and address, Google can feel confident listing a restaurant higher up. 3. Facebook is still #1, but might not be for long. In 2017, 74% of restaurants said they used Facebook as their most frequent social media channel. This year, that number has dropped to 69%. 4. Instagram grows in popularity. Picking up some of Facebook’s slack, Instagram was named the social media channel of choice by 24% of restaurants in 2018 – an uptick from the 18% it sat at in 2017. Instagram is also quite popular with new restaurants. 78% of restaurants that opened in 2017 or 2018 reported having an Instagram account for their business, while just 68% of all restaurants are on the photo-sharing site. For consumers, visual social media sites Instagram, Snapchat, and Pinterest were the only social media platforms that grew in popularity in 2018. 5. More successful restaurant businesses are less likely to use Twitter. For this next point, we compared restaurants that saw profits increase in 2017 to restaurants where profits stayed the same or stagnated. 44% of restaurants that saw their profits decrease or stagnate in 2017 use Twitter in 2018, while just 39% of restaurants where profit increased use Twitter. Twitter is the least popular major social media platform. Overall, Twitter saw a significant decline in popularity for restaurants. 59% of restaurateurs used Twitter in 2017 to market their restaurant, but in 2018, that number is down to 41%. Conversely, successful restaurants were more likely than less-successful counterparts to use Instagram. Which of these 2018 digital marketing trends surprised you the most? Comment below with your answer, and download Toast’s 2018 Restaurant Success Report for more statistics on restaurant technology, digital marketing, and staff management.